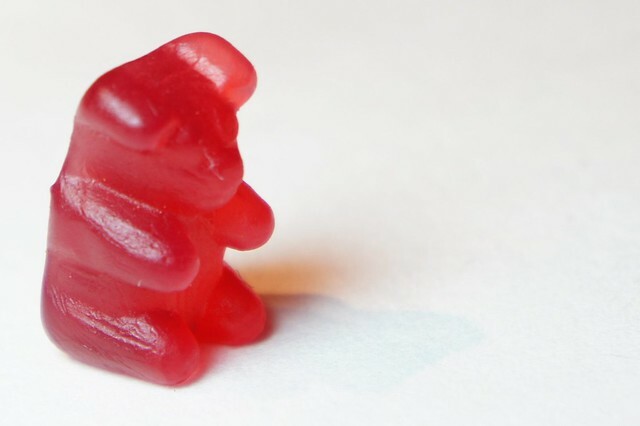 If you have a sweet weakness for fruit snacks or know someone who does, try making homemade gummies. They are fairly simple to make and only a few ingredients are required. Packaged fruit snacks can include genetically modified additives, chemical preservatives, artificial flavors and synthetic coloring. Most are made with only nominal amounts of real fruit, and if they contain gelatin it may come from a questionable source. Making your own allows quality control, and after experimenting with the following basic recipes you can come up with a tailor made favorite. Use easy to remove molds or a baking pan and then cut into cubes or use small cookie cutters. Most recipes will keep for weeks in an airtight container stored in the refrigerator. Make extras, because they won’t last long. Some prefer grass-fed gelatin powder to regular gelatin, and if you want to avoid gelatin completely try substituting with agar agar (sometimes called kanten) which is a seaweed derivative. Any of these compounds will allow the gummies to firm up. Generally, use more for a firmer snack or less for a softer variety. Most recipes use 100% juice or real fruits. Also, organic honey and pure maple syrup can be used to provide sweetness. Although typically made as fruit snacks, don’t be afraid to sneak in some vegetables too. For example, carrot and beet juices will blend in with the fruits and provide a nice, natural color. Use fresh or frozen berries instead of food coloring for vibrant gummies. This recipe suggests adding in vitamins or other additions with health benefits like kombucha tea, which is an antioxidant rich probiotic. Also experiment with different flavors like coconut mango. Prefer a bit of a kick? Try this sour gummy recipe that uses a little lemon or lime juice to liven things up. Also, you can add a bit of pure fruit pectin for tartness. Or sample this sweet and sour spin that incorporates both tastes. Making homemade snacks like gummies are easy, fun and a good excuse to make a mess in the kitchen.